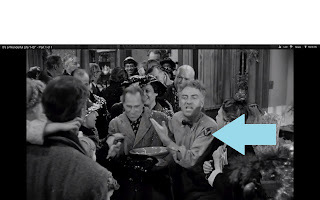 The Bedford Falls Sentinel - An It's a Wonderful Life Blog: And just where do you think Ernie parks his car? I'm betting at the Bedford Falls Garage! And just where do you think Ernie parks his car? 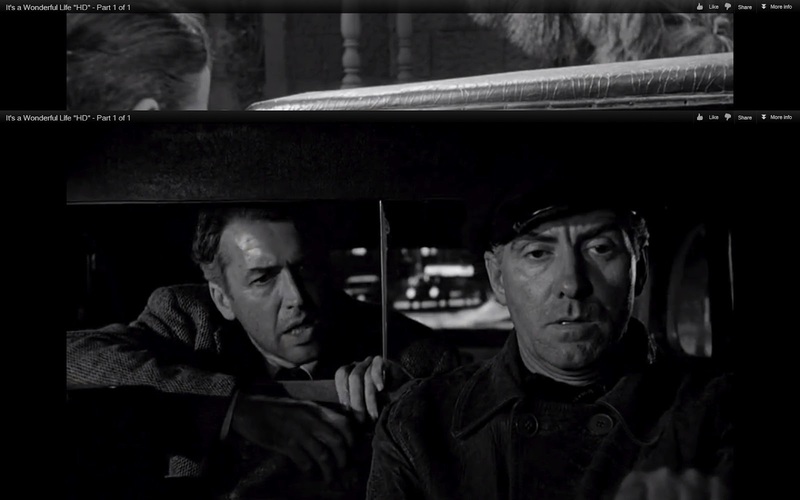 I'm betting at the Bedford Falls Garage! Want to come along Bert? Yet again, we are visiting a building that you likely might not think exists and in some respects you are correct. No one ever visits this place while on screen in our film. It's not featured or even mentioned in the script at all. 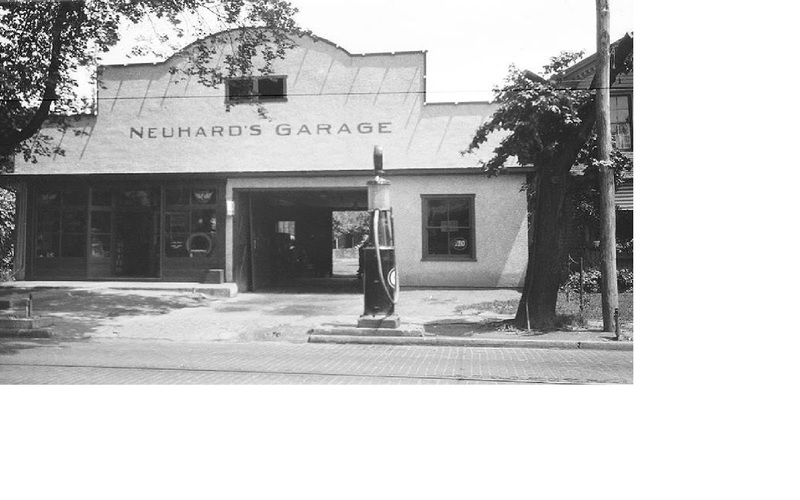 I'm talking about the Bedford Falls garage, the place where either cars could be rented, fixed, or possibly a fill up. 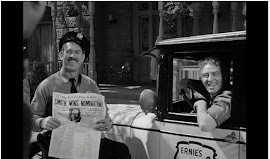 I'm stretching it a bit, but since realizing that there is a garage in the town I make the assumption that Ernie is connected to it in some way. It seems possible that he just drives the Taxi home and leaves it there parked, but living in town maybe he helps run or is a partner in the town garage and it houses or serves as a hub for his taxi service. 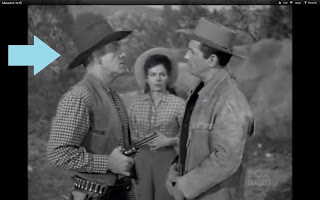 Ernie Bishop being one of the largest figures in the film that is not a Bailey is played by Frank Faylen who is best known for this portrayal. 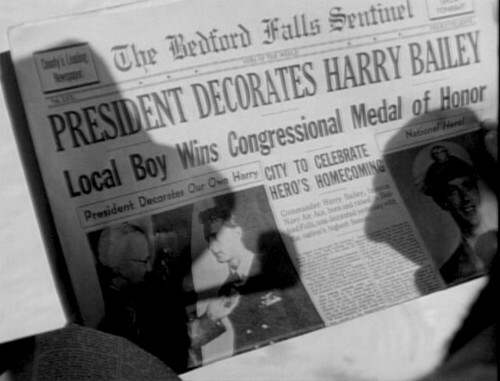 Ernie lives in Bedford Falls with his wife and at least one child. Along with Bert and Marty and I guess you could argue Sam Wainwright he completes the cadre of friends George maintains throughout his life. Ernie served as a parachutist during World War 2, jumping into France presumadly prior to D-Day. We don't see him during the fighting montage, but for whatever reason he's wearing his Army Air Force Patch on George's crucial night. Larger version of Ernie's patch. Without George Ernie wouldn't have received a loan for his house and likely would have spent his days in Potter's slums. From that we can understand the change in Ernie's life when George meets him while experiences the WoG (Without George) world. Ernie seems to have lost his wife and kid who have ran out on him and like the town, he seems entirely changed. Faylen has been affiliated with some great box office smashes such as uncredited roles in Gone with the Wind and Sergeant York (fun to go look for him if you have or enjoy these movies) and had a habit of playing taxi drivers in films. 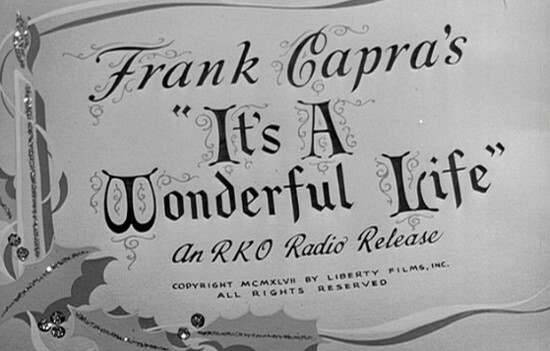 1937, 1938, 2 in 1940, 1941, 1942, 1943, 1944, 1946 and of course in 1947 ALL had Frank cast as a cabbie. Quite the streak! 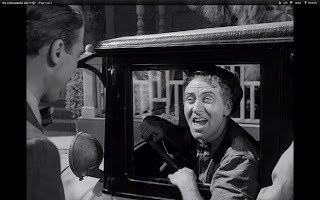 If that's not enough there are probably a dozen other early roles that he played various other drivers such as ambulances and whatnot. Over the years he appeared in various films and on many television series when not getting arrested. Fayden passed away in 1985. Anywhere, onto the slim view we have of the Garage in the movie. 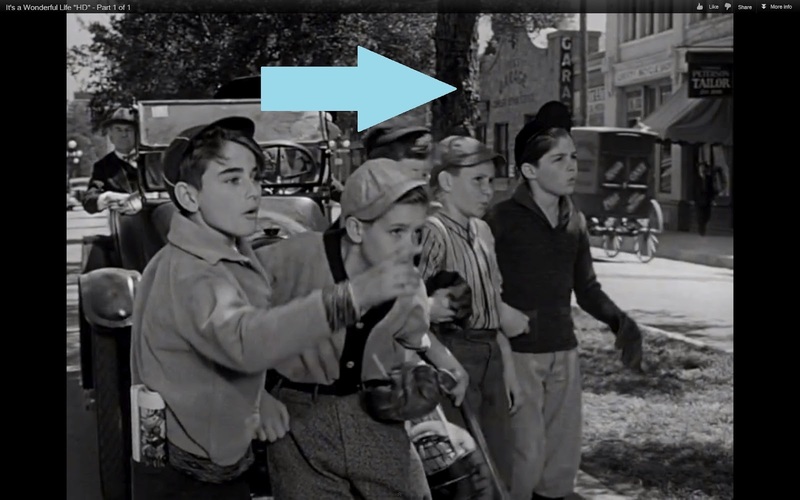 Early in the film we can see it behind the group of boys just as George is about to walk into Gower's store. Now the building looks like it has two main front doors and a long upright sign in addition to the writing along the main face. Shape seems more like some kind of old time fire station which oddly enough we don't see something like that on the film but does match what I use for my village collection nicely though. Some of these features match up to the Enesco piece , while some do not. It's not a normal 40's filling station by any means as this is representing an earlier decade but we can at least see that is in indeed there. The Enesco piece looks much more appropriately like a 40's version but I wish they had attempted to keep the main style of the building to resemble the little of the movie garage as possible. Still, the Enesco Garage is one of my favorite buildings and as mentioned being from the fourth series it's in good company. I love the colors, the details, and the various features. Here is the Enesco Bedford Falls Garage. Unboxing first of course. Enesco Bedford Falls Garage: Box front. Please click below at 'Read More' to continue with all pictures. Enesco Bedford Falls Garage: Large front. The garage is by far the largest building in the collection as you'll see by the box alone. And the building herself. 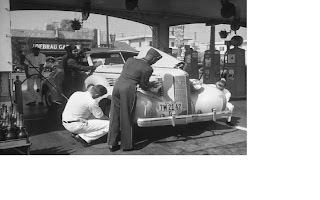 Amazing color, details of the gas pumps is great. Multiple large doors, tons of signs on all sides and angles. Unique shape, look, and features. The building is large, but is by far one of the top pieces of the collection. The 4th series was just awesome, shame it's also the most rare. Enesco Bedford Falls Garage: Gas pumps. While not seen, for once Enesco did something great here. Enesco Bedford Falls Garage: Great rear signage on the back of the building. Looks a lot like the peak in the film. Enesco Bedford Falls Garage: Rear door. Enesco Bedford Falls Garage: Rear side even looks great. Love the old style lettering. The building looks so great in full light view, that the lit up sight is not as good but still nice. The building's light tan color means that the entire building gives off a glow which is okay but nothing spectacular. No real complaints about this one though. Park Ernie's cab here and enjoy. GEORGE: "Ernie, I'm a rich tourist today. How about driving me home in style? Bert opens the door of the cab and puts George's suitcase inside." ERNIE: "Sure, your highness, hop in. And, for the carriage trade, I puts on my hat." The Garage Sign is shown during the opening "prayer scene" - Ernie prays "George is a good guy, give him a break God" as the sign/outside of the building is being shown.